The US-European funded "Syrian Civil Defence" also known as the "White Helmets," have been incrementally exposed as perhaps one of the most extensive and elaborate deceptions in modern war propaganda. Posing as both "rescuers" of civilians trapped in alleged Syrian and Russian airstrikes, and "monitors" reporting alleged "atrocities" carried out against armed militants fighting the Syrian government, evidence has mounted that they are in fact accomplices with militant groups including listed terrorist organizations, as well as propagandists. 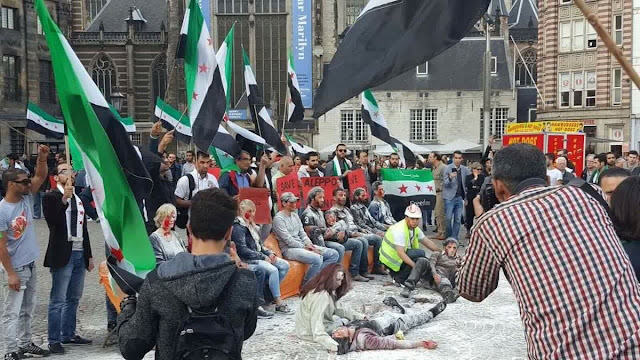 In early October of this year, protesters in Europe easily recreated virtually every "rescue" scene portrayed by "White Helmets" simply by applying flour and red paint to their faces and lying in the streets of European cities. As part of the "Save Aleppo" campaign, the protesters likely sought to bring the "reality" of the "White Helmets'" work to Western audiences, but maybe did so a little too literally - revealing that many of the scenes portrayed by "White Helmet" camera crews in Syria were likely staged in a very similar, theatrical manner. In real warfare, bombardments generally leave behind unspeakable carnage, including bodies burned beyond recognition, dangling limbs, gushing wounds, and piles of tangled gore. The "White Helmets'" videos are suspiciously absent of these realities, and instead feature almost exclusively the flour and red paint extras seen protesting in Europe's streets last October. It was noted last October that the only feature missing from the "White Helmets"-inspired protests in Europe was the backdrop of a ruined city and rubble to "bury" actors in. But a recent video shared on Facebook by Syrian activist Mimi Al Laham, exposes this charade with this final feature included. What appears to be a "White Helmet" video shot in a style known as the "mannequin challenge" - in which actors remain still as a camera moves around them similar to a technique employed in Hollywood movies for dramatic effect - has surfaced on YouTube. It begins with three men attempting to remain still as a camera moves around them. The men are posing in the rubble of a collapsed building. Two men are dressed as "White Helmet" volunteers, and the third man is laying down with his legs partially buried beneath rubble. An audible sound effect is added to the soundtrack - similar to that heard in a war movie when a character is dazed and his ears are ringing - before suddenly the characters begin moving and shouting - the volunteers begin "unburying" the trapped man who feigns screams of pain. Aside from the "mannequin challenge" stylization, the video is utterly indistinguishable from the full summation of the "White Helmets'" previous "filmography." Like all of the "victims" the "White Helmets" have "saved," the man in this video is clearly not physically injured and is simply covered in dust just as protesters in Europe were, and just as all of the alleged "victims" the "White Helmets" have claimed to save in Syria have been in the wake of alleged airstrikes. In this video, the three men are undoubtedly actors. The "victim" was undoubtedly, intentionally buried in preexisting rubble, not trapped in it from an airstrike. The fact that two of the actors are fully dressed in "White Helmet" uniforms acquired through the tens of millions of dollars provided to the organization by Western governments, reveals a potentially serious breach in ethical behavior - similar to ethical violations committed by legitimate medical and rescue workers who use their resources and protected status for political or military purposes, rather than missions of mercy. The "White Helmets" are perhaps the perfect embodiment of the entire Syrian "opposition." A facade created by foreign interests to divide and destroy an entire nation, unhinge an entire region, all while posing as heroes of "freedom," "democracy," and "humanitarianism." For other supposed nongovernmental organizations (NGOs) worldwide receiving funding from the US and EU, they should seriously consider the company they find themselves among - terrorists, liars, and actors preying on people's good intentions while exploiting misery they themselves are directly involved in creating.